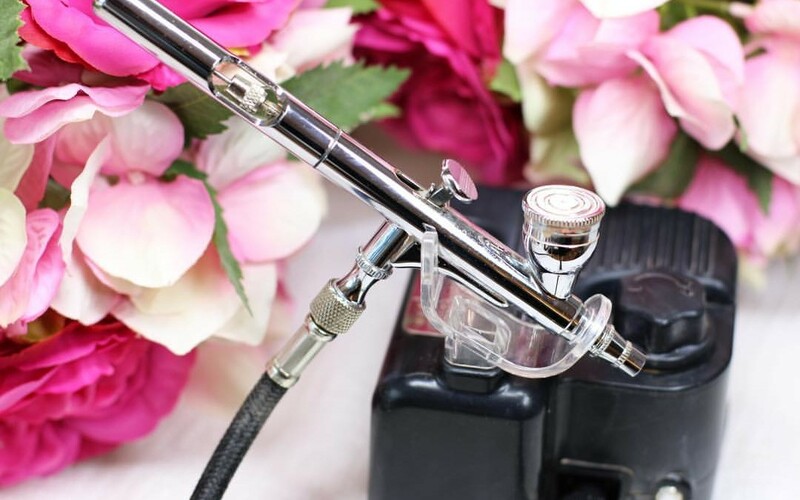 Airbrush makeup is the method of applying a special type of makeup to the skin, which is sprayed gradually in a fine mist using an airbrush compressor. This is different to conventional makeup, which is hand applied using makeup brushes and sponges. Airbrush makeup has bloomed in popularity with the development of HD film and television because it doesn’t settle into pores and wrinkles. What brand of Airbrush Makeup do you use? We use an exclusive professional airbrush makeup by Elementwo because I can trust it to hold up to tears, heat and humidity whilst providing the flawless gorgeous result my clients expect. Elementwo is the best premier lightweight silicone-based airbrush makeup I have ever used and provides a flawless HD-quality finish. Is Airbrush Makeup long lasting? Airbrush makeup wears longer than traditional powder or liquid foundation and has the ability to stay put upwards of 12–24 hours. I use a silicon based formula which is completely waterproof, transfer resistant and provides longer lasting wear without fading. How does Airbrush Makeup feel? Airbrush makeup is exceptionally lightweight and most clients say that it barely feels like they are wearing any makeup at all, (but they still look flawless!) Airbrush also tends to calm any nerves because the air application is cooling, refreshing and soothing for many. Airbrush makeup can be applied either minimally (natural) or full (glam). For clients that are after a very full/photographic coverage I would apply a silicon based foundation first and then airbrush over the top. You can still have a natural coverage with any blemishes hidden via spot concealing using the airbrush. Airbrush makeup provides flawless coverage by minimizing skin imperfections whilst giving skin a beautiful, natural finished looking result. It also covers pigmentation, discolouration and acne scarring perfectly. It diffuses fine lines and wrinkles, minimizes the appearance of large pores, and covers any skin discoloration. Who can wear Airbrush Makeup? Airbrush makeup is suitable for people of all ages and every skin condition. It has a buildable coverage so you can wear it sheer and natural or go for a much fuller coverage – whatever you desire.